Letos Villas situated in the heart of Gaios on Paxos Island in Greece, is the ideal destination for a dream summer holiday. They are uniquely designed and exclusively built luxury villas with marvelous view over Gaios and Agios Nikolaos Island. Letos Villas combine a perfect location with a comfort stay where you can enjoy the outstanding view of the sunset, just a few hundred meters away from Gaios town making easy your stay and your moving. All kind of holidaymakers, friends, couples or families, can indulge themselves in a variety of activities such as water sports in crystal clear water, bustling night life, exceptional tastes, shopping, anything you desire. Letos Villas is an ideal destination for couples and families searching for a relaxing and restful vacation. Recently renovated, consists of 4 comfortable bedrooms making the stay of 8 persons a wonderful experience. Absolutely loved Paxos. Had a fantastic holiday with extended family. We were 6 adults an 2 children in the Letos Villa. It worked great, plenty of room for everyone both inside and outside on the large balcony. The view is fantastic and as the house faces east you have the most amazing sunrises from the balcony, and shaded from the afternoon sun and heat. The walk to town takes about 8min, and a bit longer with kids as it is a bit steep. Supermarket and all the shops are not far. Gaios is fantastic: beautyful, clean, friendly, great shops and good eating. The waters around are turqoise blue and so clear. The trip to antipaxos is a must. I could go on and on. Thanks for a great holiday. Thank you Dimitri and mother Maria (who baked these yummy pastry puffs for us). Beautiful villa. It was everything we hoped for. Very spacious and clean with the most amazing view from the very spacious verandah. Maria, who looked after the villa, is the most lovely lady. Nothing is too much trouble. I highly recommend this wonderful villa on this special island. Thank you so much for your kind words. We are looking forward to seeing you all again in Paxos. You were so nice tenants. Letos Villa - Absolutely PERFECT! On line the photos looked perfect and the price was affordable to us. The lovely owner, Dimitris, kindly picked us up from the port of Gaios in Paxos and took us 5 mins up the hill to the villa. We were taken straight into to a big comfortable sitting/dining room, in front of us a glass paneled wall with sliding doors leading out onto a huge veranda. Beyond - a simply spectacular view of the old port of Gaios and the sparkling blue sea. We were in heaven and we had only put a foot inside the door! The photos on line don't do enough justice to this spacious, clean, comfortable and very well equipped villa. The veranda has good wooden sunbathing recliners and nice solid chairs and 2 tables to choose which to breakfast at! Downstairs I had one of the double bedrooms with French windows that led out onto another huge paved area with tropical plants. We were not overlooked by the row of 5 apartments on our left and it was a very quite spot full of bird song in the mornings. Dimitris is a most accommodating owner and could not do enough to make sure we had everything we needed before he headed back to his home in Athens. He is converting another fabulous house behind our villa with 5 bedrooms and an even higher veranda that will have the same view over our rooftop, giving both villas privacy from each other. This would be an amazing place to come with extended family and fill up both houses. We had a bedroom each in Letos Villa and that was perfect but this house could very comfortable take more than twice the amount - making it a bargain for a big family! It is a 5 minute walk down the hill the the beautiful town of Gaios with many more interesting shops than I have ever seen on mainland Corfu. There is CAPRICCIO an amazing Gelateria on the harbour front (Hazelnut, Fig & Ricotta, Lemon and Basil, Dark Chocolate, Pistachio, Coconut etc) all freshly made with natural ingredients several times a week. We hired a car (Ionian Car Hire the cheapest at 28 euros a day) and explored the island daily. So many INCREDIBLE little beaches and olive groves. Look out for Fotis on Monodendri Beach. 15 Euros for a top quality massage (he used to work for the Athens football team) under the olive trees metres from the sea! Paxos is now our favourite Greek island. It has not been destroyed by tourism. Letos Villa is the best villa we have stayed in in our 30 years of coming to Greece. I cannot recommend it highly enough! Thank you Dimitris for having us! We'll be back! Casa molto bella, terrazzo spettacolare, proprietari disponibili e molto gentili. Ho un ricordo bellissimo dei giorni trascorsi. La consiglio! La casa è accogliente ed i servizi che offre sono ben gestiti. Sarà perché considero magico quel posto ma noi siamo stati veramente bene. Per non sembrare troppo di parte appunto un difetto: di fatto ha un solo bagno ed è poco per 4 camere da letto, che sono grandi. Imagine you want to spend a holiday in the villa with a great sea view, located not so far from the sea and in the same time in a quiet place. Finally that should not cost you too much money. Some people would say it's impossible (usually the choice would be either 1km or even more away from the sea or not in a quiet place, or simply very expensive). Others would wonder why to put so many restrictions if you can rent a car and choose whatever location you like. For us who are a couple of non-drivers with a toddler it was vital. It seemed to be kind of tricky to do but we found Letos Villas. When you look from the terrace you think that village is quite far away. But in fact it takes less than 5 minutes to walk from the villa to the center of village. Villa is very spacious (actually much more space than we needed, but we didn't mind that), there are all the necessary facilities, big terrace and really outstanding view. Gaios is the east of Paxos so sunsets are very dull over there (it looks like someone is turning the lights slowly, no change of colors in the sky or something like that). However due to the eastern location there are proper beautiful sunrises. Gaios itself is a good village. You can find pretty much everything you need: supermarkets, restaurants, shops, a beach. There are tours to other isles. You can drive or take a bus to other villages of Paxos. It makes Letos Villas a really great combination. I would definitely recommend it as a place for people who want to spend some time on Paxos. Finally I want to thank Dimitris for being such a good host! Thank you very much for your kind words reviewing our villa. You are helping us a lot in explaining details of the villa's surrounding scenery to our potential customers, they will be beneficial to know choosing our villa is an ideal choice for their vacations. I am glad that you are happy with our hospitality and we are looking forward to you coming to Paxos again. You are always welcome. Villas are located 5 minutes away from the New Port of Paxos and the tourist village of Gaios. Only about 300 meters away from the villa there’s a supermarket, a bakery and restaurants. 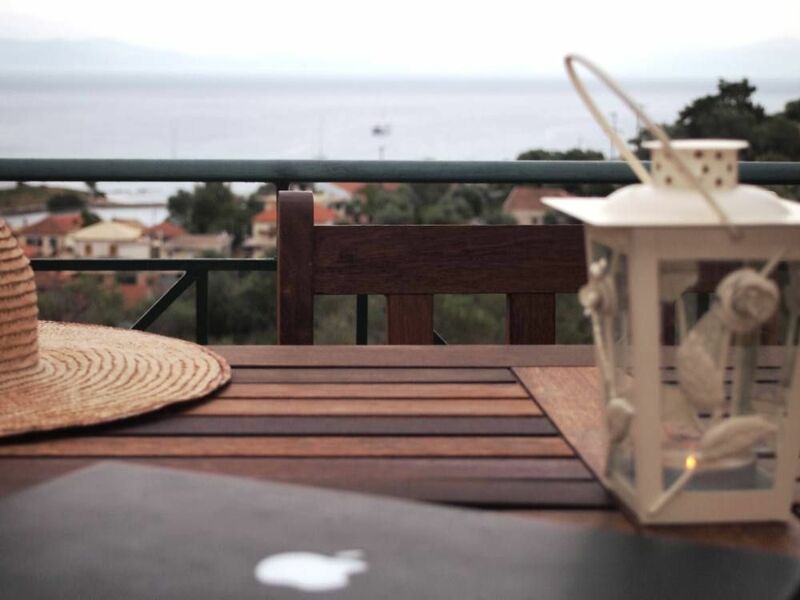 At Villa Letos, the Ionian landscape binds in harmony to the traditional Greek hospitality.